If you are looking to save a little money by cleaning solar panels on your own, you may want to think again. We have come across some very scary stories of home owners and companies with commercial solar panels. The dangers of cleaning solar panels on your own may include damaging your solar panel system or even worse, injuring yourself or loved ones. If you have solar panels on the ground, the risk of hurting yourself is far less than a three story roof, however the risk of damaging your solar panels still exists. Using the wrong solution to clean your solar panels could potentially ruin your entire system resulting in thousands of dollars to repair or replacing your system. The most important thing to consider is the opportunity cost of cleaning your solar panels on your own vs. paying a professional to get the job done right the first time. 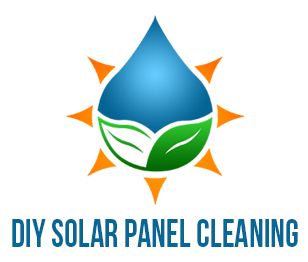 If you have all the tools to get the job done and your solar panels are on the ground, then it may be possible to clean your solar panels yourself without paying a team of experts. Safety First: If you are attempting to clean solar panels on your roof, please make sure you have the proper safety equipment. If you do not have the proper safety equipment, please consult with a professional. Clean Panels Early Morning: Cleaning your panel very early in the morning while the sun is not beating down on your panels is very important as very hot panels will evaporate water fast and leave panels streaking with marks. Do Not use Metal Objects: If there is built up grime or bird poop on your solar panels, do not use metal objects to scrap it off, however, use water and a sponge to gently remove debris. Use Distilled water and not Hard Water: If Hard Water is the only water you have at your location, be sure to squeegee 100% of the water of the panels and then remember to wipe dry. What factors will contribute to dirty solar panels? All of these factors will eventually contribute to the decline in power production and prevent sunlight from reaching solar cells that produce power. The more dirt that hits your solar panels, whether it be from wind, dust or rain, the more your power production will decline. 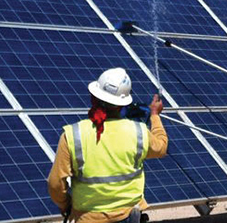 Keeping your solar panels clean is incredibly important for the overall power production and peak performance. Checking your solar panels often will prevent problems from occurring in the future. Physical inspections of your solar panels is extremely important, however if you have solar panels on a 2-3 story roof and they are hard to access, this is going to be a problem. Personally checking your solar panels on a weekly or monthly basis to make sure nothing has landed on your solar panels. If you are really going to do it yourself, make sure you have all the proper equipment when attempting to clean your solar panels. Once you have checked off all the tools to do the cleaning yourself, you can now get started. Hopefully this helps you understand a little better what it takes to do solar panel cleaning yourself.